For some companies, this API is the actual product that they sell (think of communication provider Twilio or data giant Amazon Web Services) for others, it is a valuable tactic in support of their core business. The tactical aim can be to distribute your product or service through other channels. As an activities provider, you can embed your service into the sales process of another travel company, such as an airline, which integrates the API on their website to build a better traveler experience, offers more services, and gains revenue from the distribution of the add-on services. Promoting your product or service on another website is another element. Offers on third party websites can be dynamically adjusted based on the user information that is available in this context. This marks the end of promotion which doesn’t take into account the users’ context. In addition, API integration can nourish your product or service. Companies like Facebook, Twitter, Foursquare, and Mapbox rely on this. Your product is enriched through the integration with other services. Whether this is through the use of your service for logging into a new platform (social login of Facebook and LinkedIn which does not require new users to set up a new account and facilitates data exchange between the login provider and user) or the enrichment of data in the service that you are linking to (Foursquare uses Mapbox maps and enriches them with user information which helps the latter build a more powerful maps offering). Last, but not least APIs can rationalize processes. Internally, the entire spectrum from production applications to innovation prototypes can be powered through your API. There is an API for (almost) anything these days — excerpt data from invoices, find the fastest route between two points or provision telephony calls and messages across the globe. Companies can leverage their own and third party services to streamline their value chain and processes. 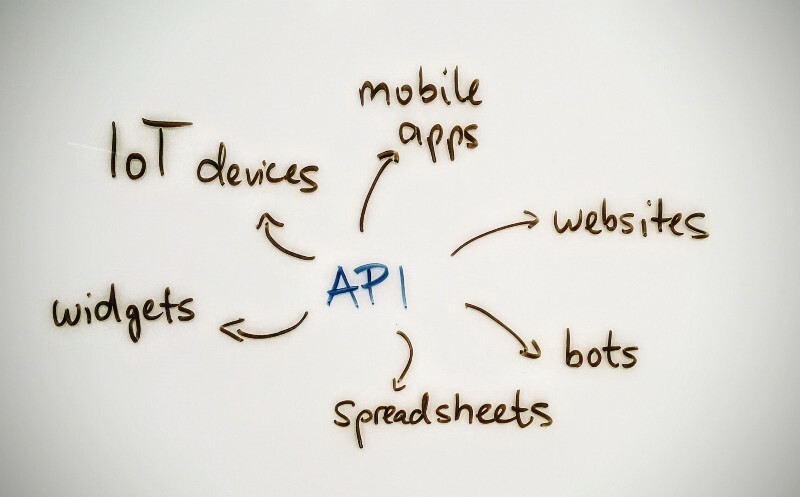 Your own API can be a great starting point to rationalize the IT setup you use internally. Dogfooding — the idea that you are relying on your own service offers as much as others — is key when it comes to offering a service that your customers love. The data channels which act as programming interfaces can fuel a whole range of applications. Traditionally websites, widgets, and mobile apps receive (part of) their data from the requests that are sent to a database through the means of an API. Developers code requests to databases and, hopefully, receive the requested data or just a quick yes or no back as an answer. The API is a secure tunnel which allows developers access to very specific element of data. When integrating a payment provider on your website, you might not want to handle the entire payment process but rather use a third party service such as Paypal. Nonetheless before confirming the order and sending out merchandise, you want to confirm payment. Paypal’s API would send back a quick “successful” when you request the information regarding a specific payment status. That is as much as you need to know to continue your order fulfillment. The same technology can now power a range of other mediums. Think of your Excel spreadsheets being powered by up-to-date data, IoT devices exchanging information or bots pulling necessary information to support users. to access the full white paper!